~ Use outdoor kitchens or cooking set-ups in warmer weather, opting for solar cooking over wood-burning methods, and use indoor stoves for cooking to double as space heaters in cold weather. ~ Cook large quantities to feed many people to best make use of fuel and human energy. ~ When needing to heat or boil any water that is not for consumption (as in double-boiling to melt wax for candle making), use grey (recycled) water. 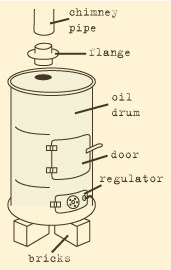 A small wood stove can be made from a clean and dry oil drum – such as a 15-galon, closed-head heavy gauge grease drum. STEP 1: Cut a small horizontal rectangular opening near the bottom of the drum for ash removal, and a square opening above that in the center of the drum for loading the wood. STEP 2: Cut doors from sheet metal to overlap the two openings by 1/2” all around. STEP 3: Bolt the doors to the drum, and make door catches for both doors from 4” corner braces. Cut and notch with a hacksaw and bend the braces to fit the curve of the drum. Bolt the door catches to the drum. STEP 4: Cut draft regulators out of sheet metal: drill holes into them and through the doors in the pattern shown in the illustration, then bolt in place. The principles behind a high-efficiency stove are to produce the least amount of smoke (air pollution), use the least amount of fuel (wood), and produce the most amount of heat. 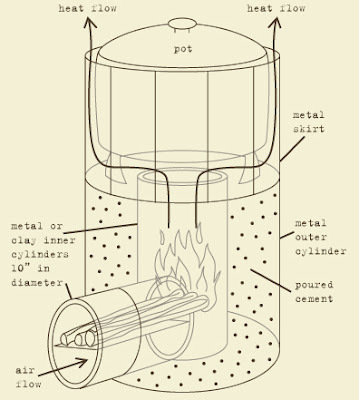 A “rocket elbow” stove uses materials easily found and is constructed to be a one-pot cooker. A fuel-saver, this stove uses twigs for burning, and incorporates a “skirt” around the pot which increases efficiency by minimizing heat loss. The three-stone method is the most efficient if cooking outdoors and no high-efficiency stove is available. STEP 1: Set up three large stones or cinder blocks on open ground in a triangle. STEP 2: In the center of the triangle, arrange crumpled papers and kindling. Light the fire, then place a metal rack on top of the cinder blocks. STEP 3: Begin to feed long sticks and twigs in through the gaps between the cinder blocks, along the ground. These will feed the fire by only burning at the ends. STEP 4: Place your pot of food or water on the rack to heat. Adjust the amount of fire and heat by pulling sticks back or adding more sticks. A solar cooker requires no fuel to cook food other than the sun from a bright sunny day. Cooking food this way takes longer than using fire, up to twice as long, but can cook meats, stews, bread and more. 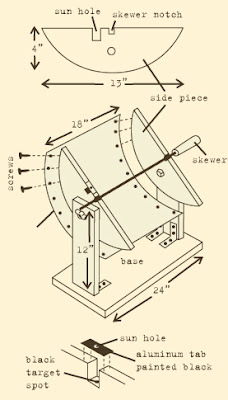 Below is a guide to making a simple solar cooker for one family, as well as a guide for building a spit-centered one for cooking large pieces of meat. STEP 1: Using a flexible silver reflective windshield shade, fasten the bottom left and bottom right edges together using staples or sewing with a needle and thread, or taping together with silver duct tape. This will create a funnel shape. STEP 2: Set down a bucket or plastic waste basket on a surface (ground, table) and place the joined edge of the funnel cooker down across the top. 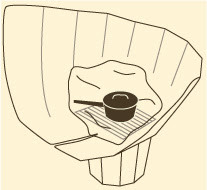 Place a grill or cake rack down in the centre of the funnel (this will press down on the flexible funnel). STEP 3: Place your food ingredients in a black pot with a lid. Place this pot inside a clear plastic bag and tie closed. Rest the pot on the rack and angle the solar oven to directly face the sun for maximum reflection. If windy, set a stick across the wide part of the funnel to hold it open. This solar cooker is a more permanent version of the windshield design as it uses durable materials, and is designed to be more effective than the windshield cooker because of its smooth curving metal for a hotter focal point. However the main design for this is for skewering food like meats and vegetables. To cook pots of food or water, rig a metal grate to act as a shelf, making sure it places the pot in the focal point of the sun’s rays and can swivel to counteract the rotation of the reflector. STEP 1: Using 1”-thick wood (such as pine or plywood), mark and cut out 2 half-circles measuring 13” wide and 4” high, with a 7 1/4” radius arc. Clamp the 2 pieces together and plane and sand the edges to shape (clamping will make both sides identical). STEP 2: Bend a 16” x 18” rectangular square of sheet aluminum to fit the curve of the side pieces. Work carefully to avoid creasing or scratching the sheet. Make sure the shiny side of the aluminum is on the inner side of the curve. STEP 3: Drill a hole in the centre of the wood pieces. Notch out 1/4” square divets in the centre of the straight edge of the semi-circles, the same width as the spit to be used. Unclamp. STEP 4: Use two dozen 1/2” aluminum screws to tack the aluminum to the curved edge of the wood pieces. This completes the solar cooker section. STEP 5: To make the base, take two 3”x6” planks of wood 1” thick, clamp together and drill a hole at the centre near the top. Unclamp. STEP 6: Screw the two planks of wood upright to a baseboard large enough to fit these, making sure the distance between the boards is equal to the width of the solar cooker (18”). STEP 7: Using two 2 1/2” bolts and wing (butterfly) nuts, fasten the solar cooker to the upright boards, using washers between the bolt head and washer and wood surfaces. STEP 8: For a spit, use a long rotisserie skewer or a 1/4”-square steel rod filed to a point at one end. Clean and oil the spit, skewer a piece of meat, wrap tightly in aluminum foil (dull side out) and place the spit in the notched divets of the solar cooker. Adjust the cooker to point directly to the sun, maintaining this orientation by tilting the reflector and position of the cooker from time to time. Excellent info! I like the high efficiency stove.